Beauty is breathtaking! Every so often I stumble upon something that just stuns me. It happened the other night as the sun sank behind the horizon. 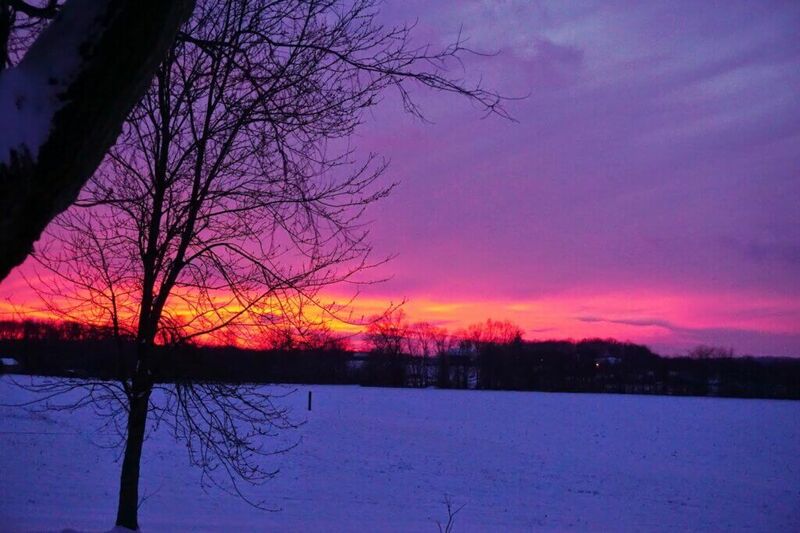 The sky surrounding our house was transformed with a blend of colors from peach to pink to purple. It seemed that our whole property was enveloped in a coral glow like the insides of a conch shell. Preparation for dinner halted numerous times as we gazed at the awe-inspiring artistry of God’s creation. The view from the kitchen table. It’s in times like these that I am overwhelmed with the beauty of our God. The Master Designer of our universe has revealed a glimpse of His exquisiteness in the mirror of His creation, and those who recognize it must take a moment to gaze upon it and worship Him. As the writer of Psalm 27 voices his confidence in God during times of difficulty, he also expresses his desire to gaze upon the beauty of the Lord by seeking Him in His temple. His deepest longing is to dwell in the house of the Lord all the days of his life. He has seen God’s goodness and longs to experience His presence continually. Does the Psalmist really want to pack his bags and move into the temple made of gold and silver? I don’t think he does anymore than we would desire to make our bed in the local church building. I believe he understands that there is no manmade structure that could contain God’s power and beauty. “The Most High does not live in houses made by men. As the prophet says: ‘Heaven is my throne, and the earth is my footstool'” (Acts 7:48 & Isaiah 66:1). God’s presence extends everywhere simultaneously and even the whole world cannot contain Him. David, the Psalmist, has seen God’s goodness throughout his life and longs to dwell in the presence of the Almighty One forever. He understands that residing in the shadow of the Almighty provides a hiding place in time of trouble and a place of deliverance in time of need. As I gaze at an exquisite sunset, a sparkling mountain stream, or an alluring summer sky, I recognize the Creator’s hand and I worship Him. What a comfort to know the shelter and safety we can experience in the constant presence of our great God. He will keep us safe in His dwelling and will always hear the voice of those who seek Him. What better place to abide all the days of our lives than in God’s presence gazing on His breathtaking beauty!